Every season new fantasy football heroes arrive on the scene from out of nowhere and the 2018 season will be no different. Pro Football Talk Line has compiled a list of potential breakout players. Some we have watched breakout and some were watching and waiting for the breakout. Not all of these players will make the pro bowl or be fantasy MVP candidates, but at some point, they might be a top waiver wire add or a simple addition to your team. Let’s take a look at this weeks crop. Conner has faced many hardships over his young career. A few years ago he overcame Hodgkin’s lymphoma in college and won the Disney spirit award for beating cancer. Fast forward three years later, now Conner has another chapter to add in this comeback story. Because of a Le’Veon Bell holdout extending into week one of the regular season. Conner was given the opportunity to make his first career NFL start and he didn’t disappoint Sunday in Cleveland. Running hard and breaking arm tackles at will with great balance and vision. When it was all said and done, he put up a very impressive Le’Veon Bell type stat line. Totaling 192 yards and two touchdowns in an overtime tie with the Browns. 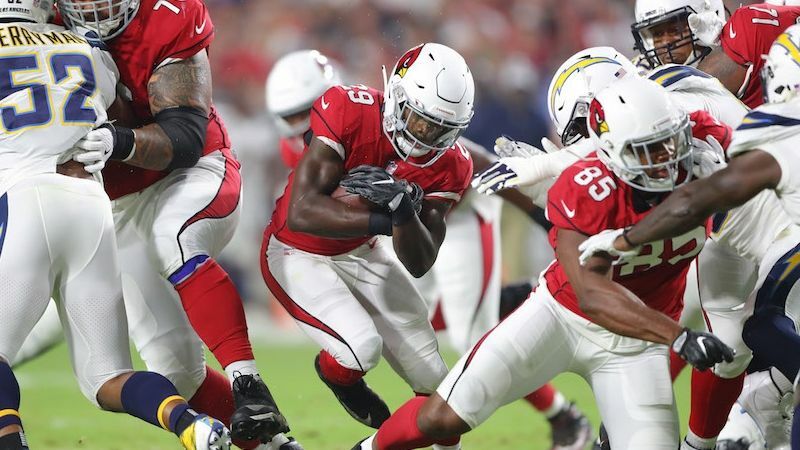 Conner always showed strong signs of being an NFL caliber running back – dating all the way back to his college days. Blending his powerful running style with incredible resilience and mental toughness – he punishes defenders with his bionic stiff arm and aggressiveness. He broke 88 tackles in 2014 while at the University of Pittsburgh. He’s not just a one trick pony either if needed he you can line him up in the backfield to run routes. He’s smart with a high football IQ and a knack for finding cutback lanes and holes in the defense. As a sophomore, he racked up 1,765 yards and 26 scores. He doesn’t have Le’Veon Bell’s elusiveness or quick burst. But he does have a finesse to his game. Even if Bell does return soon, after Sundays showing Conner might have earned himself more playing time either way. Conner could be the teams running back of the future. The former Hawkeye is a versatile receiving threat capable of separating from linebackers. He also possesses phenomenal body control and can adjust mid-air to catch poorly thrown balls. Kittle’s quickness and speed makes him a mismatch. Towards the end of last season, Kittle and Garoppolo’s chemistry grew as they connected on 11 passes for 194 yards a and touchdown over the final three games. Kittle did all this while playing through a high ankle sprain, as well as many other injuries. Before hurting his shoulder earlier this preseason he was rebuilding chemistry with Jimmy Garoppolo. Now back and appearing healthy in the week one’s contest. Kittle looked explosive leading the team in catches five and receiving 90 yards. Kyle Shanahan’s system has always created good space for tight ends to rack up yardage. The lack of size on the team mixed with Kittles second year in the system has him looking at a potential breakout this season. This former division 2 cornerback converted to wide receiver has good hands runs sharp routes always finds a way to get open. Last season he worked his way into the starting lineup and looked like an explosive downfield threat. Cole recorded 99 yards are more in three straight games. Jacksonville had a lot of injuries last year but cole led the team in receiving yards (748) on (42) receptions and could be a sneaky bet to lead the team again in receiving yards this season. It’s clear the Jaguars have confidence in the Cole after letting Allen Robinson go and releasing Hurns. Cole is showing his hard work ethic by putting in the time with the former two-time NFL pro bowler and now wide receiver coach for the Jaguars Keenan McCardell. Cole is one of the most overlooked receivers in the league. The Jaguars are a run-first team but somebody has to catch the ball. Cole caught three of four targets for a team-high 54 yards in Sunday’s week one win over the Giants. Right now Cole is starting at wide receiver and seems like a solid bet to improve on last years stats. Drafted by the Colts in the first round in 2015. He stands 5’10 and 185 lbs, ran the 40-yard dash in 4.33 seconds, notched a vertical leap of 37 inches and he measured a 9 1/2 hand size. Lindsay is an explosive player with good timing and instincts. Nicked named the Tasmanian devil for boundless energy and playing style he pops up after monster hits like nothing happened. Lindsay has a powerful lower half that helps him break arm tackles. Some of his runs can get out of control at times and he doesn’t always follow his blockers. There’s no denying Lindsay, is a fiery player who plays with a lot of heart. He came out of nowhere in week one to score eighteen fantasy points. Booker was listed as the number two running back on the depth chart but Lindsay has clearly taken that role over. Denver sounds like they are planning on using a hot hand approach. Even if Freeman dominates the touches. Lindsay has proven with his elite speed he can take one to the house on even given play. After Sunday’s performance, Lindsay has differently earned a longer role. Undrafted Georgia Southern product stands 5’9″ and 190-pound a 40-Yard Dash in 4.38, notched a vertical leap of 42 inches and 9 3/8 hand size. Breida is a small shifty ball carrier with the ability to create extra yardage. He runs smooth can get through the cutback lanes and make defenders miss. Breida is currently in a timeshare with Alfred Morris, but Breida is the more dynamic ball carrier between the two backs. 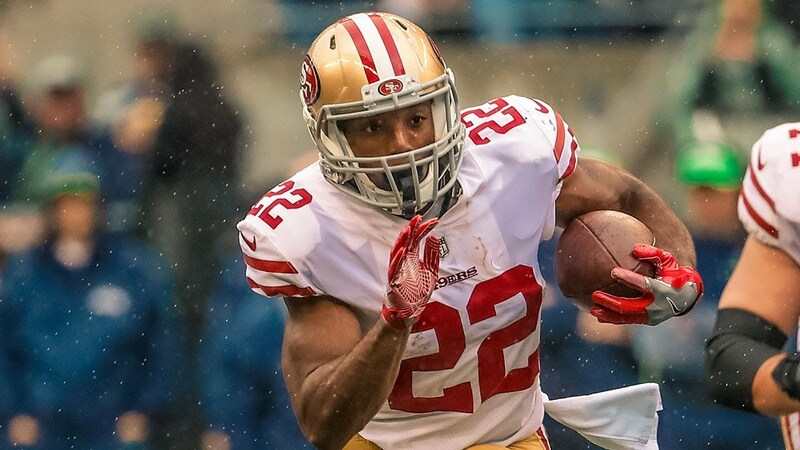 Kyle Shanahan loves Breida, it’s going to be exciting to see what he can do in this offense with a bigger workload. He rushed for 465 yards and caught 180 yards as a part-time player. Breida rushed for 46 yards in week one against the Vikings stout defense. With Jerrick Mckinnon out for the season, Brieda is in a prime spot because he’s taking over the main pass-catching duties. A fifty catch season is defiantly in the cards for Breida. With Hyde out of town and McKinnon done for the year. There will be plenty of opportunities in San Fransico. In PPR leagues, Breida has nice flex value moving forward. Pettis is going to be a terrific player for San Francisco. Don’t be surprised if he emerges as a receiving threat this season. Pettis has explosive big-play abilities combined with his well-crafted route-running and smooth pass catching centerfielder-type hands making him an interesting player to watch. Pettis made a astonishing 22-yard catch in week one against the Vikings. He ended the day with two catches for 61 yards and a touchdown. The 49ers have a laundry list of injury prone skill position players from tight ends to wide receivers. There’s a lot of reasons to think Pettis’s role will expand as we get deeper into the season. Marquez Valdes Scantling had his breakout game in week 1 of the pre-season. Putting on a show with five catches for 101 yards and one touchdown. Well, to be honest with you, he’s the ultimate possession receiver built with strong hands and good at creating separation with his deceptive speed. Valdes-Scantling is a intelligent wide receiver with all the talent and tools to make it in this league. He’s built perfectly for the position. Valdes-Scanting honed his skills in the offseason working out with NFL hall of famer Randy Moss. More importantly, he took his game to the next level setting a new school record for most receiving yards in a season his senior year. Valdes-Scantling is a big-time playmaker and does the little things well and should be an asset as a third or fourth wideout. Grant has average size but is an excellent route runner who can create separation off the line. He is very versatile with the ability to play any receiver position. By the same token, he can track down throws and shows terrific body control when needed to adjust. Grant can bring down contested catches in traffic. Not to mention, he runs with determination when the ball is in his hands. Coupled with, nice upfield quickness to pick up yards after the catch. Its also important to note, in Washington Grant was considered one of the hardest workers on the team. He fell out of favor with Jay Gruden but did show signs of life at times. Coming off an efficient season (45 catches on 65 targets) in a limited role with Washington. The veteran has taken over the starting receiver spot opposite T.Y. Hilton. He managed to haul in eight catches for 53 yards Sunday. 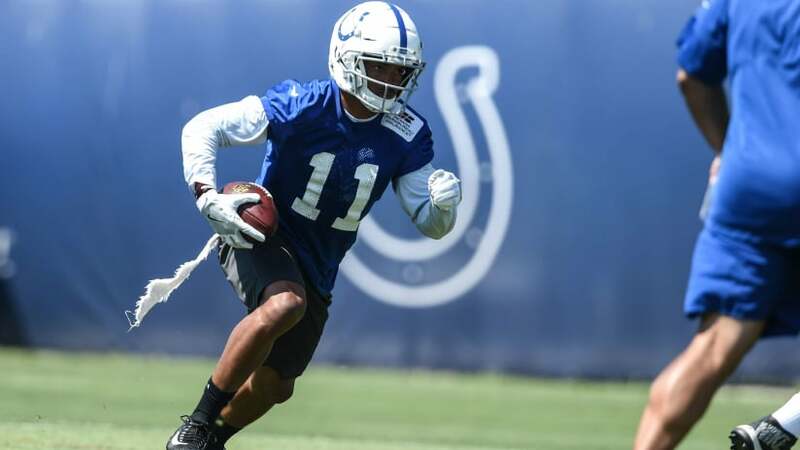 Grant could feast in the Colts new quicker passing attack. With Andrew Luck back under center and Ryan Grant receiving eight targets he already looking like a vital part of the offense. Edmond’s career college stat line is preposterous. College Stats: 938 carries, 5,862 rushing yards, 6.2 yards per carrying, 67 rushing touchdowns. He’s one of the most productive running backs in the 2018 draft class. Edmonds is undoubtedly a weapon out of the backfield and he can be a game changer. His speed is ridiculous he has human joystick moves and runs with patience behind his blockers he’s a smart runner. He has a solid lower half that he uses to get leverage and finish runs. Edmonds rushed for 24 yards and made four catches for additional 24 yards receiving in week one. Edmond’s looks like the handcuff for David Johnson. With dual-threat DJ back and fully healthy it will be hard for Edmonds to find consistent playing time. But with his multi-versatile running style and skillset, Arizona needs to find some opportunities for this bantam sized speed demon.